The Things We Do For Research: A Writer Falls! | AUTHOR. ACTOR. SWORDSMAN. The Things We Do For Research: A Writer Falls! So when I fell down the cliffs for the third time I wondered: is this a good idea? I was at Quebec, in Canada. I was attempting to climb the cliffs that led to the Plains of Abraham. On those one of the pivotal battles in world history had been fought. And up these same cliffs a hundred British Light Infantry had gone at dead of night on September 13th 1759, spearheading a last ditch effort to seize the city from the French and, effectively, claim North America for England. It seemed like a good research idea when I booked to come. The battlefield was largely soccer fields and condos now but the cliffs, undevelopable, were as they were. And it wasn’t like I was going to climb them at 2 in the morning but 2 in the afternoon. I wasn’t going to be wearing army boots, but sneakers; carrying no musket or grenades but just a back pack and water bottle. What could go wrong? Well, though the cliffs were not vertical they were really steep. They were also thick with trees, striped maple in the main. Not all of these were alive, nor standing. I don’t know what I expected underfoot but it wasn’t shale, great lumps of slate, rain slick. So when I began my assault, my trainers refused to grip for long. When I slid – a slide that threatened to turn to tumble all too swiftly – the branches on the ground I reached for crumbled in my fingers. I learned – which I suppose was the point – that you had to kick your foot in, dig a purchase out, dig out the next one. I made quite bit of noise doing it, which the infantry wouldn’t have done. They slipped silently, fell without a scream, for their enemy patrolled the cliff tops, and this was a surprise attack. Somehow, sweating hard despite a surprisingly cold early Fall, I made it to the top – bruised, wet, my hands cut from too much grabbling at wood that fell apart. 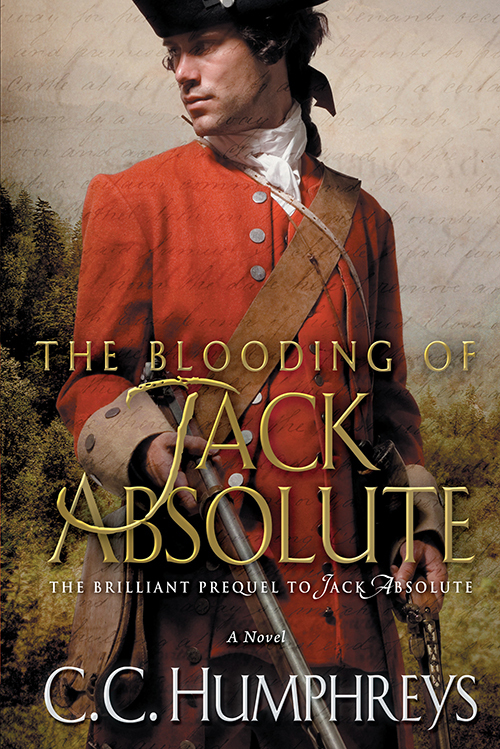 It all gave me priceless material for the attack I would describe in detail in ‘The Blooding of Jack Absolute’. And there was a bonus at the top. I’d gone to the road by the river (that would not have been there in 1759) and guessed that a particular point was the way up. At the summit I emerged right opposite a sign carved in stone, saying that this is where the assault had gone in. At least that’s what the English side said. In French it said that the English cheated because they had more boats. Double bonus! This entry was posted in Uncategorized and tagged author, blog tour, book launch, historical fiction, Inspiration, novels, Writing, writing tips. Bookmark the permalink. 2 Responses to The Things We Do For Research: A Writer Falls! Yikes! I know those cliffs. I traversed them up the stairs and thought about the soldiers scaling them with all their gear. It’s pretty sobering when you think of what people accepted as a matter of course centuries ago. I recently read the history of anesthetic and was surprised to discover the military brass (and even some military surgeons!) were resistant to its use. They believed it would make the soldiers soft if they were operating on without experiencing a little pain. Of course, when it’s not your leg being sawed off it’s easy to be brave. Cripes! That would sure toughen ’em up! Glad you know the spot. Quite the climb!